This footage is fascinating. Sort of scary and unbelievable at the same time. The tower was almost 200 feet tall and the turbines were moving close to 70 mph. The whole thing just disintegrates, which isn't what you want to see or hear about, especially with the capital investment required to get a wind turbine installed. In an unrelated story, Suzlon Energy installed some wind turbines in the Midwest that have been breaking down due to the cold weather (see link below), which is probably contributing to a declining stock price. 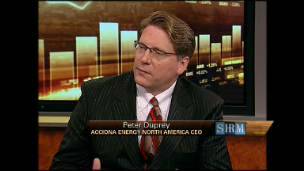 Yahoo Finance posted a very informative interview this morning with Acciona CEO Peter Duprey [CEO of North American operations]. He discusses the wind and solar energy markets and touches on the job growth and investment opportunities that are beginning to surface here in the US. A few points that surfaced in the interview: by 2009, the U.S. is expected to overtake Germany as the #1 wind energy market in the world; U.S. wind power generating capacity jumped 45% last year; wind energy poised to generate over 1% of U.S. electricity in 2008. Click picture to watch. Whether we are talking urban sprawl or the Ghostburb phenomenon, our nation and global economies and enviornments are definitely in flux. Our reliance on big oil has us feeling the pinch every time we fill up. The energy and economy crisis of '08 provides a great opportunity for advancement...advancement in new technology and business ventures. Odds are, something huge is going to hit...but who knows when. In the meantime, there are a lot of ideas of what life may be like in the future. Popular Science has a cool site describing what they call the "Green Mega City." The Green Mega City integrates a pod car, driverless bus, energy highway, Maglev Skytrain, Algae Park, power sidewalks, etc. into the whole city's infrastructure. Just click the navigation arrows for descriptions of each. On May 4, 2007, a tornado struck the town of Greensburg, Kansas. Yesterday, I posted about Studio 804, a design-build program at the University of Kansas School of Architecture and Urban Planning, and how they are helping the residents of Greensburg rebuild after the tornado. Add KSU to the list of schools helping out. During this past spring, the graduate architectural design studio at Kansas State University will help to rebuild the city through a design-build project called G3: Greensburg Cubed. Greensburg Cubed will design and construct modules, 10'x10'x10' cubes, that highlight sustainable materials and demonstrate green construction methods to meet a community need. Check out the video...I think the Book Nook and the Ice Cube are awesome designs and can picture them in parks and cities across the country. If I could, I would put a Book Nook in my backyard! Ludacris Recycles His Rims...And Could Smart Cities Be The Wave of the Future? Pretty funny video featuring Ludacris and Tommy Lee...way to be eco-friendly. The botton video discusses Smart Cities, which are cities that are controlled by an "invisible network of devices" that communicate with each other through established management systems. In theory, all the devices that are connected to the network are energy aware and are programmed to perform at optimum levels. So, what if the network is hacked? A compromise in security. Someone gains access to your whole system and shuts it down. I've heard about smart fridges that can order food from the grocery store after it has detected a low level of a certain item...I would hate to find out that someone hacked into my fridge and ordered 10 gallons of skim milk...I would probably go ape! Technology risks aside, I think intelligent energy systems are brilliant...I like the idea of building components working together to achieve energy efficiencies. However, a few concerns...from a residential perspective, how are costs tracked? Are they allocated among everyone in the system or is everyone charged separately? Can you see the performance of all your "smart" machines working in unison?